One of my favorite things EVER is Filet Mignon. Usually every time I go over to my boyfriend's house and cook we make a version of this. It's fun, flavorful, and easy to pair with wine (and all the good wine is at his house). He had his son and his friend over last night so we bought strip steaks for them (hey the good stuff is for us). UPDATE 2/25: The next time I made this dinner I created a mind blowing change that will add extra delicious flavor!! 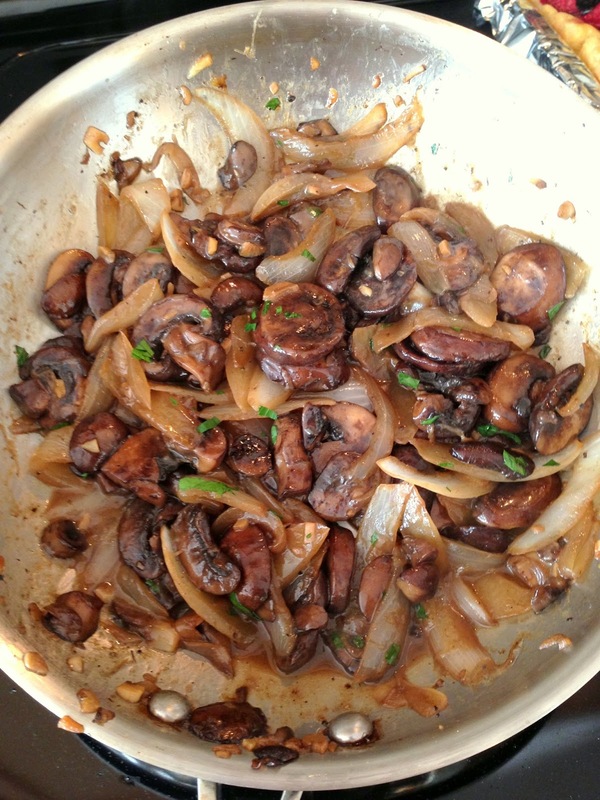 After browning the steaks add your mushroom/shallot mix to the hot steak pan and add more marsala wine. The wine should bubble up fiercely and pick up all the yummy browned steak bits at the bottom of the pan. GENIUS!! At the store I will buy steaks, mushrooms, shallots, baking potatoes, and a green veggie. Also I'll pick up a tray of olives, some aged cheese, and bread for oil dipping. First thing when I walk in the door is preheat the oven to 400F. I cook my potatoes in the oven or grill because of the flavor and texture you don't get in a microwave. It may take longer but if you are in a time crunch try microwaving them for a few minutes then bake in the oven you'll get the best of both worlds. I throw the bread in with the potatoes for a few minutes to get it toasty before serving. Next get a large ziplock bag for marinating meats. Usually I will do some sort of combo of olive oil, s&p, balsamic vinegar, Worcestershire and fresh crushed garlic cloves. 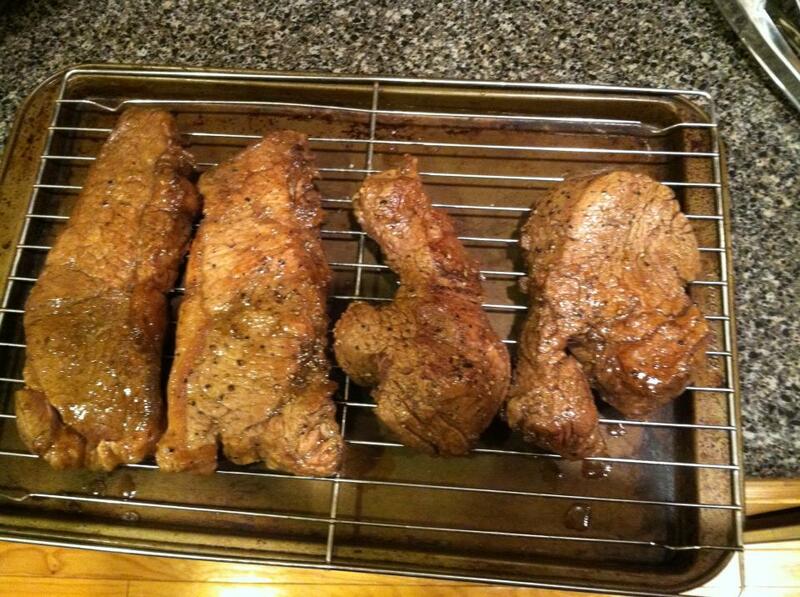 Leave these steaks in the bag on the counter you don't want to put cold meat on a hot pan or grill. Rinse off the potatoes and rub some butter on the skin, sprinkle with salt and put them in the oven. Doing this will make the skins delicious which is where all the nutrition in the potato is. Now on to the topping! Get all of your chopping done first if you put the butter into the pan before you start this it might brown and that is an entire different flavor. As far as how much butter you use? More butter = more better so it just depends how healthy you want to be! You can buy already sliced mushrooms and the shallots are small I just peel them and slice them up really quick. While they are cooking they will break up. Go ahead and melt the butter add the shallots. Try adding garlic, parsley (added at the end), or thyme if you like. Just let them sweat out for a few minutes in the pan before adding mushrooms. Once this all starts to caramelize you want to crank up the heat and add a hefty splash of marsala wine. Turn down the heat and let it cool down until you need it. Oh don't forget to pour yourself a glass of wine while your cooking. That's a very important step!! For the steaks we will brown these on a skillet with a little butter then put them on a cooling wire rack (shown below) on top of a cookie sheet. Important tip if you line the cookie sheet with aluminum foil you will not have to scrub the cookie sheet later! These can cook in the 400F with the potatoes until your desired doneness is reached. There you have it! My amazing steak dinner!! Steak topping made with onions and Worcestershire. Store was out of shallots and I ran out of marsala. Showing you how the shallots cook you can break them up with the spatula as they cook. When they look like this add mushrooms. Cooking the steaks on this rack allows them to cook more evenly. Otherwise you may have to turn them once or twice. After adding the wine!! Don't forget to let it reduce before serving!! This is what your table should look like while you cook!! A glass of wine, some olives and some crusty bread with oil dip!! YUM!!! Wine and olives at the dinner table. After your steaks are done serve and enjoy!! If there is a lot of steak juice left pour it in the mushroom mix before serving. You can serve with any red wine, but I have made some recommendations below. If you don't have marsala wine try this with whatever wine you are drinking or use Worcestershire sauce. try something new! Be adventurous! Remember it's kind of hard to mess up buttery onions, mushrooms, and steak!! Can't find shallots at the store? use sweet yellow onions!! It's good to try new things and mix it up!! Don't have the $$ budget for filet or eat beef? Can easily be made with chicken breast or tofu. This is one of my favorite dinners to make so I hope you enjoy it!! Personally I think it's much better than any restaurant you could ever try. They charge almost $8 for a mushroom steak topping and use more butter than you want to know about!! (trust me I worked in a few restaurants) That's crazy! Making it at home will give you control over the quality and calorie count of your dinner. You can be eating within 45 minutes if you follow my time saver steps (buying pre-sliced mushrooms and halfway microwaving potatoes) a lot of times it takes just as long to be seated, order and wait for your food in a restaurant!! -Meiomi - A mild red wine. For me it has a tad bit of spice and sweetness to it and is perfect for a steak when I am not feeling a heavy bold red wine. You'll feel fancy drinking this at about $20 a bottle. -Segehsio- A spicy, zesty zin! For me this is when I am feeling a little bold and spunky! Zinfandels always seem to have a little kick to them I think and this balances out perfect with any BBQ!!! Around $20ish you'll be kicking that dinner up a notch and definitely make an impression. -Ruffino Aziano Chianti Classico- Sweeter of the Chiantis I have had but still dry for a red wine. For me sometimes I just need a good ol' Italian wine. If I am feeling sweet and worth $20 I'll buy this. If I'm feeling a little more expensive I might go for the drier $25 bottle listed below. -Ruffino Ducale Chianti Classico Riserva- For when I'm feeling classy. -Da Vinci Chainti- My favorite cheap Chianti. (sooo much better than Gabbiano) It's about $10 a bottle. -Castello Trebbio Chianti- You are lucky if you can find this one. I've only found it in New Jersey and New York. Louis Martini- Is my favorite cheap Cab. I have no problem ordering this at a restaurant. Especially because it's normally $9 a glass! Or something crazy like that. Why not buy a bottle for $15 and pretend like your all that and a bag of chips? That's what I say!